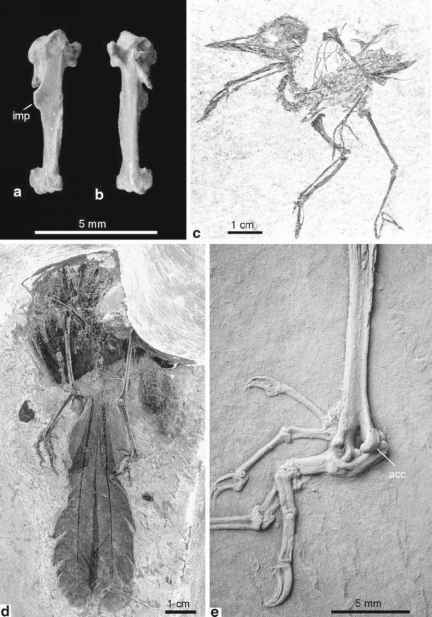 A cranial portion of a large pelvis from the middle Eocene of Switzerland was described as Eleutherornis helveticus by Schaub (1940), who assumed that it is from a ratite bird. E. helveticus was about the size of a Lesser Rhea (Pterocnemia pennata). The pelvis fragment has not yet been compared in detail with that of the neognathous Gastornithidae (Sect. 6.2), and there is no compelling evidence that it is from a ratite. Schaub (1940) noted several features in which it differs from extant ratites but agrees with neognathous birds. Pedal phalanges from the same locality, which were reported some years earlier by Schaub (1929), were considered to be too large to belong to the same species (Schaub 1940). The size of E. helveticus corresponds to that of the contemporaneous "?Diatryma" cotei Gaillard, 1937, which is based on a distal tarsometatarsus and pedal phalanges from the middle Eocene (MP 14; Mourer-Chauvire 1996) of France (Gaillard 1937). According to Andors (1992), this species is not a representative of the Gastornithidae; without discussion of any supporting evidence it was assigned to the Phorusrhacidae (Sect. 13.1) by Mlikovsky (2002). The ungual phalanges of "?D." cotei are more curved than those of typical gastornithids, but resemble the ungual phalanges described by Schaub (1929) from the type locality of E. helveticus. Although "?D." cotei and E. helveticus may well belong to the same clade, this cannot be conclusively shown with the material at hand. Proceriavis martini Harrison and Walker, 1979 from the early Oligocene of England is based on a fragmentary cervical vertebra and a referred pedal phalanx, and was tentatively referred to the Eleutherornithidae by Harrison and Walker (1979a). Houde and Haubold (1987) confirmed the similarity between these specimens and the corresponding bones of extant Casuariidae. Nonetheless, the fragmentary remains cannot be considered convincing evidence for the presence of ratites in the early Oligocene of Europe. Harrison and Walker (1979a) also described a distal portion of a radius of a very large volant bird, which they regarded as a representative of the Pelagornithidae (Sect. 6.5). As long as the vertebrae of pelagornithids are not described, there remains a possibility that the holotypic vertebra of E. helveticus likewise is from a bony-toothed bird.